How do I make IPComms my secondary SIP provider? 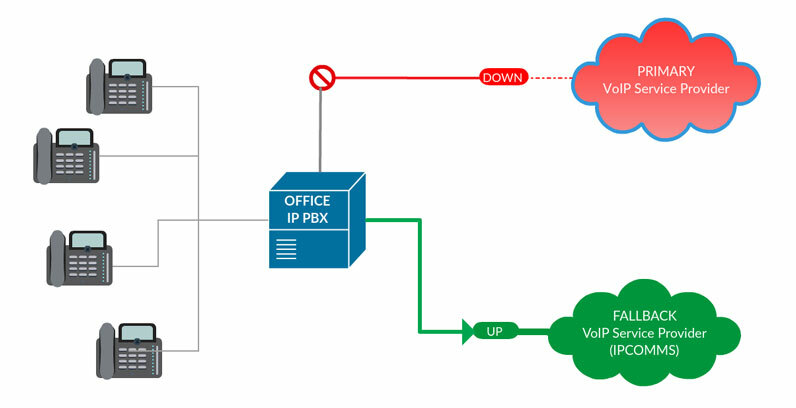 When you choose to place IPComms as your secondary routing solution for your IP PBX, we'll simply provide you with all technical details and credentials needed to connect your PBX to our network. For outbound calls: You'll simply configure your PBX to reroute calls to us in case of your primary SIP provider fails (most PBXs have this functionality already). In most cases, you can choose to make this an an automatic or manual process. During a failure, your calls are routed to our network until your primary provider's outage has been resolved. For inbound calls: The process is the same for inbound calls with one exception. During an outage, you'll need to notify your primary provider to forward inbound calls to the phone number(s) we provide you. The inbound call will then be forwarded to IPComms and delivered to your PBX via our SIP trunk. You'll just need to decide how many numbers you'll need to adequately route your calls.